At the Santa Barbara Polo and Raquet Club, Saturday, August 30. 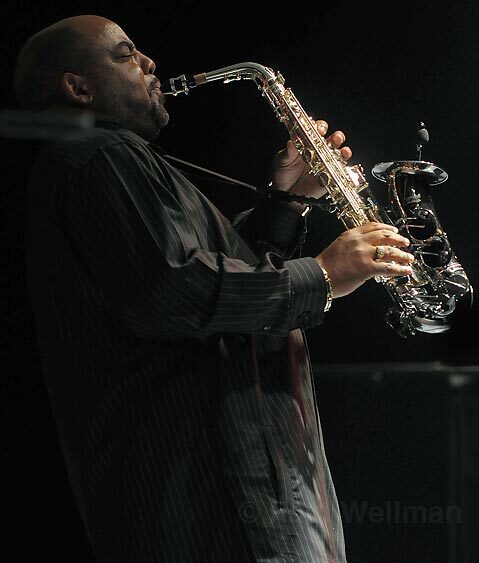 Saxophonist and Gatsby Jazz Festival headliner Gerald Albright was a hands-down highlight of the multifaceted first annual smooth jazz concert. In a nutshell, at the first Gatsby Jazz Festival Saturday at the Polo Grounds, technical bugaboos threatened to undermine the well-laid plan, but the smooth jazz party prevailed. The setting is ideal and idyllic for a festival, on a vast lawn just across the freeway and Padaro Lane from the ocean. Outside of a nutshell report, though, what, really, did the words “Gatsby” and “jazz” have to do with it? That grouse aside, smooth jazz becomes a whole lot more enjoyable once you stop judging it by the high standards of “real jazz.” This is party music, pure and simple. Call it “instrumental pop” or more specifically “instrumental R&B/funk,” a definition which hit its stride late in the show, as Brian Culbertson’s 12-piece band played a righteous medley of Earth, Wind & Fire hits (his new album was coproduced by EWF domo Maurice White). On simpler terms, smooth jazz is a good time, with some solid players, who themselves certainly recognize the musical ruse being perpetrated by the smooth jazz scene that feeds them. There are many mediocre and plain deficient sax players in smooth jazz, probably thanks to the low technical standard set by Kenny G, Boney James, et al. But veteran-in-training Albright isn’t one of those underachievers. He’s got chops and heart in order. Albright’s set-if too short, time-wise-was the musical highlight of the festival, moving between funky business going back to early in his discography (launched in the pre-“smooth” days of 1987) and then played “Misty” for us, in a fresh version, and “Georgia On My Mind” morphed into a high energy vamp during which the impish and wiry Culbertson came onstage with his “other” instrument, the trombone (he’s actually a better bone player than keyboardist). Culbertson’s own set was a power-packed half hour, fortified by a horn section, a big, beefy band sound, and a collective will to funkify. In the next edition, festival planners really should add the “smooth” qualifier to the title, owning up to truth-in-advertising and the cultural/moral good.